The stainless steel stand for Chihiros Series A lamps broadens the possibilities to place the lamp over your aquarium. You can either place the lamp higher above the tank, to give room for emerging plants or parts of a root sticking out. Or you can use the stand to affix the lamp to a tank that does not have the exact measurements of the lamp. 1.) 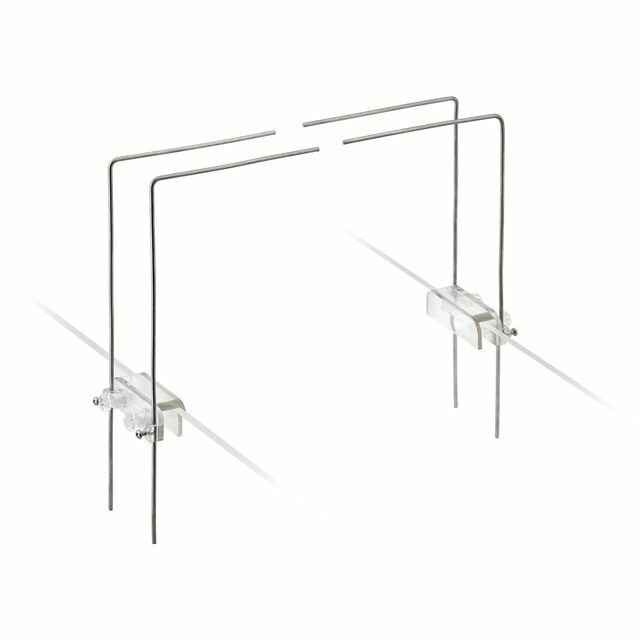 When the longer section is placed vertically and the shorter one is placed horizontally, you can place the lamp up to 20 cm above the tank edge. This also gives you a margin of 5 cm on each side which enables you to install the lamp over tanks with up to 10 cm more lenght than the lamp itself. 2.) When the shorter section is placed vertically and the longer section is placed horizontally, you can place the lamp up to 9 cm above the tank edge. At the same time the tank can be up to 30 cm longer than the actual lamp. This only works with lamps up to 30 cm, though. With lamps from 60 cm upwards only a 10 cm margin should be considered, because the weight of the lamp itself might otherwise bend the stand. It should also be considered if this mounting method - especially with the shorter lamps - is useful in regards to the illumination of the tank. Habe lange gesucht bis ich etwas für mein Easy Led System gefunden habe.Ist ein wenig wackelig aber erfüllt seinen Zweck.